JERUSALEM (AP) — Israel’s defense minister officially submitted his resignation on Thursday, leaving the government with the narrowest of parliamentary majorities and paving what looks like a clear path to early elections. With other coalition partners also flexing their muscles and the opposition parties demanding an early election, the days of Netanyahu’s current government seem to be numbered. Netanyahu was meeting with coalition partners on Thursday. Two of them, Moshe Kahlon of the centrist Kulanu Party and Arye Deri of the ultra-Orthodox Shas Party, both urged him to call early elections. Kahlon told the prime minister that holding elections would be the “right thing to do” in the current environment, and that a new, strong and stable government should be formed, his office said. Late on Thursday, the Israeli Foreign Ministry announced that Netanyahu had canceled a planned trip to Austria next week amid the deepening crisis. Lieberman’s abrupt resignation came in protest to a cease-fire reached with Gaza militants that ended two days of intense fighting. The hard-liner had demanded a far harsher Israeli response to the widest wave of Gaza rocket fire against Israel since a 50-day war in 2014, but was overruled by Netanyahu. The move immediately set off furious political jockeying, with insiders predicting it marked the opening salvo of a new political campaign. Parliamentary elections are schedule for a year from now but Israeli governments rarely serve out their full terms. The last time that happened was in 1988. Since then, elections have almost always been moved up because of a coalition crisis or a strategic move by the prime minister to maximize his chances of re-election. Netanyahu’s fiercest coalition rival, Education Minister Naftali Bennett of the pro-settler Jewish Home party, was the first to pounce, threatening to leave the coalition too if he wasn’t appointed defense minister in Lieberman’s place. That, however, appeared unlikely given the bad blood between the two and the overall shaky nature of such a slim coalition. The two were expected to meet on Friday. The government also faces a looming Supreme Court-dictated deadline to pass a contentious new law mandating the military draft of ultra-Orthodox men. 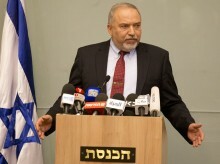 It has deeply divided the coalition and threatened to break it up even before Lieberman bolted. With such uncertainty, the major players are already positioning themselves. Netanyahu has been reportedly flirting with the idea of moving up elections himself, but the current timing is not ideal for him. He has come under heavy criticism for agreeing to the cease-fire, especially from within his own political base and in the working-class, rocket-battered towns in southern Israel that are typically strongholds of his ruling Likud Party. A poll aired Wednesday on Israel’s top-rated TV newscast after Lieberman’s resignation showed 74 percent of Israelis to be displeased with Netanyahu’s handling of the recent Gaza crisis. Netanyahu still appeared to have little competition for the post of prime minister, though support for his Likud party dipped compared to previous polls. If elections were held today, Likud looked to win 29 seats, followed by the centrist Yesh Atid party at 18 and Labor at 11. The Midgam poll surveyed 500 Israelis and had a margin of error of 4.4 percentage points. Netanyahu is also vulnerable to a potential corruption indictment that could rattle the entire political campaign. Police have already questioned Netanyahu a dozen times and recommended that he be indicted on bribery and breach of trust charges in two cases. The first involves allegedly taking gifts from billionaires and the second for allegedly discussing legislation that favored a major newspaper in exchange for positive media coverage. Netanyahu has also been grilled about a corruption case involving Israel’s telecom giant. Israel’s attorney general, Avichai Mandelblit, is expected to make a decision on charges in the coming months. Netanyahu has angrily rejected the accusations against him as part of a media-orchestrated witch-hunt that is obsessed with removing him from office.